Make instant messaging come alive with the Live! Cam Socialize webcam and Live! Central 3 software! The software lets you add a little spice to your conversations with dramatic voice effects and funny visual effects. Communicating and connecting with friends and family have also been made easier with a host of different features. The Live! Contacts button brings up your online contact list instantly so that you can start chatting right away while the Media Show and Desktop Share features let you share your pictures, presentation slides and videos through popular instant messaging services. Equipped with a built-in noise-canceling microphone, engage in clearer voice chats with reduced background noise, while basking in better face-to-face interactions with the new low-profile design. Enhance your instant messaging with video! Better together. 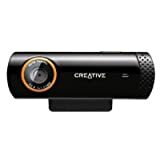 Creative Webcams, optimized for Windows Live, add vibrant video to your chat experience.